This site is put together by Mangrove Mike (intrepid fisherman, wine lover, IT Geek, old-time punk, sensible dad, gadget lover). I have Merewether Weather infomation here as well as power usage and power creation stats from my solar panels. There is also lots of interesting stuff (code, reviews, gadgets) that I have written and accumulated over the years and this site shares as much of it that is possible. The weather station I am using is the Davis Station Vantage Pro 2. I use the data logger connected via a USB/Serial bridge to a Mac Mini Server where I use use WeatherCat (WeatherCat) to collect the data. I also send the data up to Weather Underground and CWOP. Tides are generated by Xtide a great program that I have used for a few years. Love it! The power monitoring is done with the Current Cost meters. An Envi collects the main hour power usage and a Trec is separately monitoring the power generated from out 3kW PV Solar system. This is also connected via USB to the Mac Mini and the data is collected via a custom perl script which transfers the data to this website as well as other sources. Inspired by Andy Stanford-Clark (http://stanford-clark.com), Dale Lane (http://dalelane.co.uk/blog) and Andy Piper (http://andypiper.co.uk) all data is published via MQTT which centralise the code and devices into a publish and subscribe model. All of the code and systems I use to collect and publish theis information is on my Mac Mini Server. We have two solar systems installed. 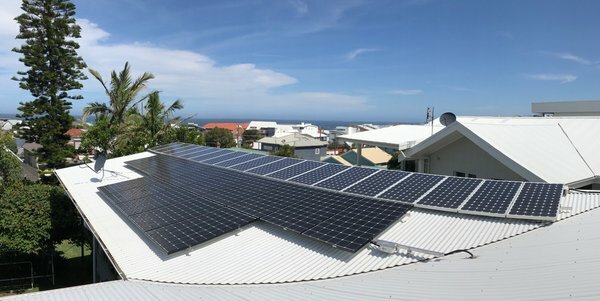 The first a 3kW system installed in 2010 and the second a 5.02kW system installed in November, 2018. Here are my panels on the photo on the right. They are ECOKES 170Wp Mono Cystalline Panels. The inverter is a Schneider Conext RL 3000E (which replace a dead Oelmaier ) and the 3KW system was installed by Eco-Kinetics .This document has more details - Solar System Specs . 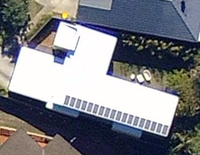 The new system uses much smarter tech and was installed by HCB Solar (https://hcb-solar.com.au) . The panels are 15 x NEW LG ELECTRONIC NeON2 335W Solar Panels, Inverter - 1 x SolarEdge 5kW Inverter, DC Optimises - 15 x 370W Optimiser. Eventually this will be connected to a battery.